Glenn married Diane Michalchuk in 1967. They have three children; Marcy, Jason and Kerri. Glenn has a building construction business and they reside in Minnedosa. Donald was killed in a car accident in 1966. David married Jacki Westburg in 1976. They have a daughter, Katrina. David is presently mink ranching south of Minnedosa. Terry married Sharon Meadows. They have a son, Derek. Terry works with his brother Glenn. Rick married Linda Johnson in 1978. They have two children; Christopher and Wendy. They are living in Wetaskiwin, Alberta, and Rick is presently working on building construction. years working; Gail in the bank and Jim as Manager of a finance company. Ted is employed at the University of Manitoba in Winnipeg as a Biochemical Technologist. Peggy and Stan Chan, both psychiatric nurses at the Brandon Mental Hospital, reside in Brandon with their little girl, Lesley, one year old. Olaj Walter Emanuel, oldest son was born in the Scandinavia district and spent his childhood years with the family on a mixed grain and fur farm, commonly referred to as twenty-four, receiving his education at Nedrob school. 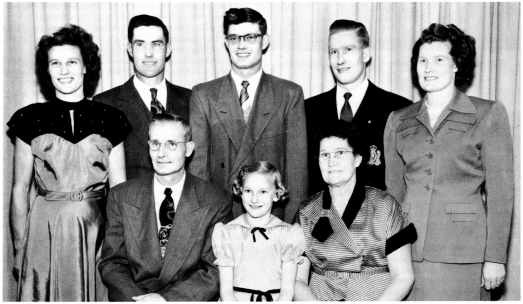 In August of 1944, the family moved to Winnipeg to manage and operate a large mink and fox farm. Two years later Walter purchased S.W. 3-18-18, east of Erickson, previously owned by Edward Johnson, and the family returned to reside there. On October 25, 1947, he married Florence Viola Nylen, daughter of Fred and Marie Nylen. They had three children; Brian Walter born on March 17, 1949, Gerald Frederick born on August 2, 1950, and Marilyn Mae born on April 24, 1956. They were all raised and educated in Erickson. During these years he was a school bus driver and with the help of the family, rented more land and built up a herd of registered Holstein cattle. From 1967 to 1971, he was also employed with the Erickson Co-op as Farm Supply Manager. They were all active members of Bethel Lutheran Church and took part in community affairs. The Holm Family. Back Row, Left to Right: Della, Walter, Lennart, Leo, Ruby. Front Row: Eugene, Linda and Ruth.